CF Industries Holdings, Inc. CF reported profits of $49 million or 21 cents per share for the fourth quarter of 2018, down roughly 89% from a profit of $465 million or $1.98 in the year-ago quarter. Earnings fell well short of the Zacks Consensus Estimate of 51 cents. The bottom line in the year-ago quarter includes a sizable tax benefit from the impact of the U.S. Tax Cut and Jobs Act. Net sales rose 3% year over year to $1,132 million in the quarter, mainly driven by higher average selling prices across all segments. However, the figure missed the Zacks Consensus Estimate of $1,296.8 million. Overall sales volumes fell year over year in the quarter as lower volumes across ammonia and ammonium nitrate businesses more than offset higher granular urea sales volumes. For 2018, net earnings were $290 million or $1.24 per share, down roughly 19% from $358 million or $1.53 per share recorded in 2017. Net sales for the year went up around 7% year over year to $4,429 million, aided by increased selling prices. Net sales in the Ammonia segment declined roughly 27% year over year to $250 million in the reported quarter. Ammonia sales volumes fell 40% year over year to 720,000 tons, hurt by lower demand for fall ammonia applications due to cold and wet weather in the Midwestern United States as well as lower production volumes. Average selling prices of ammonia rose roughly 22% year over year to $347 per ton. Higher energy costs across Europe and Asia coupled with reduced production due to the environmental restrictions in China tightened global supply and demand balance and boosted prices. Sales in the Granular Urea segment rose roughly 40% year over year to $345 million. Sales volumes increased around 11% year over year to 1,119,000 tons, driven by higher production. Average selling prices for granular urea rose 26% year over year to $308 per ton on the back of tightened global supply and demand balance. Sales in the urea ammonium nitrate solution ("UAN") segment went up around 19% year over year to $342 million. UAN sales volume edged up 0.7% year over year to 1,933,000 tons in the quarter. Average selling prices rose roughly 18% year over year to $177 per ton due to tightened global supply and demand balance. Sales in the ammonium nitrate segment fell around 22% year over year to $97 million. Sales volumes declined around 28% to 416,000 tons, due to reduced production volumes. Average selling prices increased 7% year over year to $233 per ton as reduced production in Asia and Europe resulting from higher energy costs tightened global supply and demand balance. CF Industries ended 2018 with cash and cash equivalents of $682 million, down roughly 18% year over year. Long-term debt was $4,698 million, flat year over year. The company repurchased 9.1 million shares for $409 million during the fourth quarter and also completed share repurchase program worth $500 million. Its board has authorized a new $1 billion share repurchase program. 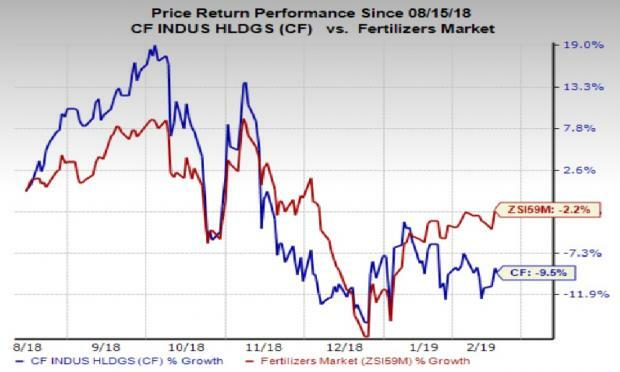 CF Industries sees strong nitrogen fertilizer demand in North America during the first half of 2019. Corn and wheat plantings are forecast to rise by four million and one million acres, respectively, in the United States compared to 2018. Per the company, nitrogen prices globally declined through the end of 2018 and into 2019 after reaching their highs early in the fourth quarter, impacted by seasonally low demand in the Northern Hemisphere and moderating energy prices across Asia and Europe. However, CF Industries noted that industry fundamentals should be supportive of global nitrogen prices during first-half 2019 as demand in the Northern Hemisphere starts to materialize. The company said that China's role in globally traded urea continued to shrink in 2018. It expects Chinese urea export volumes to be in a similar range in 2019 due to tighter environmental restrictions and persisting firm energy prices. Moreover, urea imports into India and Brazil was 6.3 million metric tons and 5.5 million metric tons, respectively, in 2018 and CF Industries sees total Indian and Brazilian urea import requirements to be in a similar range this year. The company also expects its capital expenditures to be $400-$450 million in 2019. Shares of CF Industries have lost 9.5% in the past six months compared with the industry’s 2.2% decline. CF Industries currently carries a Zacks Rank #3 (Hold). Kirkland Lake Gold has an expected earnings growth rate of 20.9% for the current year and carries a Zacks Rank #1 (Strong Buy). Its shares have shot up 113% in the past year. You can see the complete list of today’s Zacks #1 Rank stocks here. Mosaic has an expected earnings growth rate of 23.5% for the current year and carries a Zacks Rank #2 (Buy). Its shares have gained 24% in the past year. Israel Chemicals has an expected earnings growth rate of 10.8% for the current year and carries a Zacks Rank #2. The company’s shares have rallied 34% over the past year.